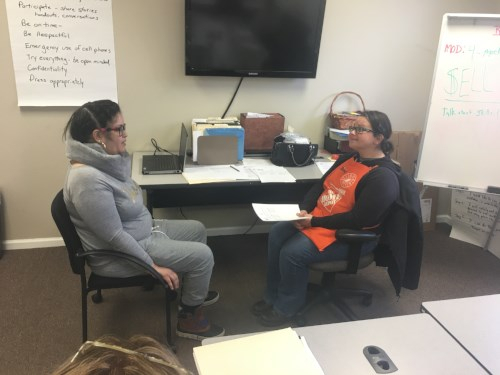 Bethany Pignallo of Home Depot (left) conducting a mock interview during Module 4 of our Ready, Set, Work! Program. Our Reentry Program helps ex-offenders return to society, assisting them with finding appropriate medical, mental health, housing and employment services. Reentry Programs provides you with an opportunity to become an independent and productive member of the community. If you want more information about our Reentry program please email info@theccj.org or call 518-346-1281 ext.22. Job Skills Training: Unemployment is often the critical issue facing returning offenders, and the key to understanding why recidivism rates are too high. Thanks to a generous grant by United Way we launched a job skills training program on October 1, 2014 dedicated to bridging this employment gap. Our Job Skills Training will consist of two proven courses targeted to the reentering population - Ready, Set, Work! and Thinking for a Change. Ready Set Work! is a 20 hour course designed to prepare the ex-offender to find and keep employment by teaching job readiness skills and assisting with the employment search. Participants receive assistance with resumes, developing interview skills and finding full or part time employment. Through our partnerships with community resources and employers and their participation in RSW, we aim to provide our clients with direct access to services and employers who can help with minimizing the internal barriers placed upon an individual with a criminal record who is looking for employment and/or to further their education. In addition to job readiness, we highlight the importance of "SELLING YOURSELF" as well as establishing, nurturing and maintaining relationships that form into a network that can act as a doorway to opportunity. Our "List of Friends" consist of: SUNY SCCC Career Counseling, Home Depot, CDTA, Golub (Price Chopper Warehouse), Nationwide Maintenance, Moonlight Landscaping, HW Staffing Solutions, Quad Graphics and the National Food Bank. We're constantly working to expand our "List of Friends" in hopes that it will not only grow but also provide our participants with greater chances at gaining substantial employment/career opportunities. Thinking for a Change: Thinking for a Change (T4C) is a 13 week, sessions that meet twice a week on a ongoing enrollment designed to help the ex-offender analyze their thinking processes, understand what they are feeling, and find new ways of solving problems. These new skills will help the ex-offender respond differently when they find themselves in difficult situations. T4C has many of the job skills components of Ready, Set, Work! – but is designed to help returning offenders with significant barriers to employment. MRT (trademark) is a systematic treatment strategy that seeks to decrease recidivism among juvenile and adult criminal offenders by increasing moral reasoning. Its cognitive-behavioral approach combines elements from a variety of psychological traditions to progressively address ego and positively impact social moral behavioral growth. This resource is available for those looking to create and print resumes, do a job search on-line or even just check email. For more information please email info@theccj.org or call 518-346-1281 ext.22. The T4C program has three main components: Cognitive Self Change (what we say to ourselves inside our head and how to control our thinking and feelings), Social Skills (skills we use to deal with situations involving other people) and Problem Solving (a skill for dealing with difficult situations). The program has three main components: Cognitive Self Change (what we say to ourselves inside our head and how to control our thinking and feelings), Social Skills (skills we use to deal with situations involving other people) and Problem Solving (a skill for dealing with difficult situations). 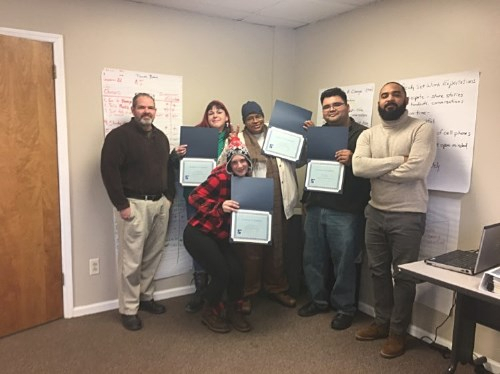 Tim Staples, Re-Entry Coordinator (far left) and David Reali, CAB Coordinator (far right) celebrate the successful completion of Thinking For A Change with the program participants.